The Christmas Home Tour will be November 25, 2017. Ready to order tickets? Receive your confirmation and invoice by email. Pay your invoice and pick up your ticket at the location you select. If you are interested in being on the tour or joining our legion of volunteers, please complete the form below. I'd like to have my home on the tour. I'd like to help with planning the Home Tour. I can volunteer the day of the event! The Taste of De Soto will be on Saturday, August 12th. Enjoy the food of 7 food establishments in De Soto. $20.00 per ticket. Tickets on sale at the De Soto Farmers’ Market and all participating restaurants: The Arlington Event Center, The Dog House, Fountain City Grille, Pogolinos, Flour de lis, Off the Hook and LaChance Vineyards. For info call Debby at 636-586-4570. Arlington Event Center – 207 E. Main St.
Dog House – 605 S. 2nd St.
Fountain City Grille – 302 N. Main St.
LaChance Vineyards -12237 Peter Moore Ln. Pogolino’s – 530 N. 2nd St.
Tickets can be purchased from any participating restaurant, the library, or the farmers’ market. 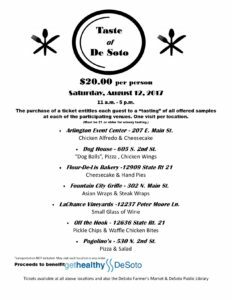 The first annual Taste of De Soto will be held on Saturday, August 12th. 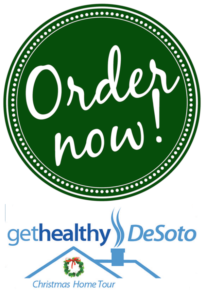 It’s a new fundraiser for Get Healthy De Soto, and we hope that you can attend. Tickets are only $20 and can be purchased from any of the participating restaurants. More information will be coming soon!